This is a record of my Intermediate training, up to the taking of the exam. Mike Bryant GW6NLP has suggested that I do something useful for the Wrexham A.R.S. as my Intermediate course project. 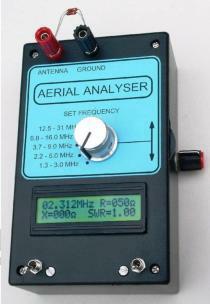 The project is building an antenna analyser, the parts come as a complete kit from Australia. 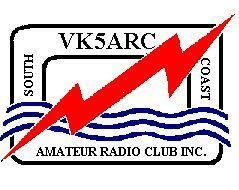 Graham Thomas VK5GCT supplies the kits as a way of generating funds for his local club The South Coast Amateur Radio Club (SCARC) Inc. The complete kits cost AU$150.00 or about £90.00 GBP plus import tax. The kit requires a reasonable level of soldering competence and component recognition skills. Hopefully it will arrive in time for me to take the kit to the Wrexham A.R.S. in it’s new venue at the Brymbo cricket club on 6th July. There are some excellent video’s on youTube by BYRONLOCAL they are very informative taking you from delivery to testing of the unit. 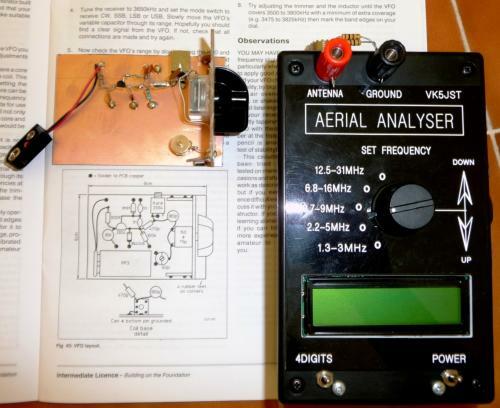 The kit has now been assembled and is ready for testing, everything so far has gone to plan with the exception of one incorrect component being shipped with the kit, there should have been a 100uH RF choke for the 1.3-3.0 MHz band but unfortunately the supplier had doubled up with 2 x 10uH RF chokes. Maplin carry the same part so that is easy to rectify. Well side by side here are my projects, pretty much from one extreme to another and built in reverse order, I built the VK5JST Aerial analyser first which is a bit over the top for an Intermediate project, so I have also decided to build a VFO in“Ugly Style” as it is described in the Intermediate course book. I have decided to include this photograph as it is difficult for people who have little or no knowledge of electronics to visualise what a circuit diagram will produce when assembled and put together correctly. 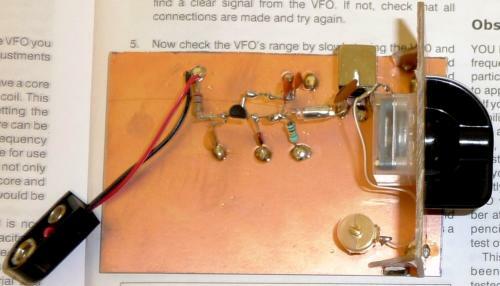 This is a larger view of the Ugly Style VFO, as per the circuit diagram in the book Intermediate Licence - Building on the Foundation. Don’t be afraid of building this type of project, as you can see it looks just like the diagram in the book. I have now started the theoretical side of the intermediate training course with Mike Bryant as our instructor, we have competed two sessions and I have found them very interesting.Pat Harper MW3HUU is also taking the course with me and we are lucky in the fact that Mike Bryant is giving up two evenings a week to us for these sessions. Mike has a wealth of knowledge to impart onto us and he has a very practical training method with demonstrations of the subjects covered in the course syllabus he makes the subject easy to understand. We have now completed the practical assessment stage and we are steadily working through the worksheets. I must admit that I am finding it very stimulating, it is surprising what you take for granted having worked in the electronics industry for so long and being used to the terminology in the working environment, the amateur radio terminology in the foundation and Intermediate handbooks is sometimes quite different to the standard industrial terms that I am used to, these are the things that can catch you out if you are not careful so for the period you are in training and when you take the exam you need only to use the terminology expressed in those handbooks. even some of the component symbols can be slightly different leading to confusion. Patrick and I have now worked pretty much all the way through the work sheets in the Intermediate handbook under Mike’s guidance and our latest sessions with Mike are mainly test question sessions along with revision of critical subjects. We are both feeling confident and anticipate that the application for the test papers will be made around 7th - 8th October which if we allow for 10 days for the RSGB to process the application would place us at about 23rd of October for our exam. I know that Mike Bryant will see that we keep up the study until the exam date. Tonight was another successful lesson, we ran a mock exam to get us both prepared for the soon to arrive exam, it is useful to determine what our areas of weakness are and then we can concentrate our study better. I also use the HAM TEST on line web site to keep the subjects fresh and monitor my progress. The countdown to the test date has started, Mike Bryant has applied for our examination papers today, Royal mail allowing we should be taking the examination as planned on 23rd October. We have spent the last few weeks taking mock exams and tonight we both sat in front of a laptop with Mike and did a few HAMTEST’s on line. We now only have two more evening sessions to go with Mike before the big day so fingers crossed. Well Hopefully both Patrick and myself have made sufficient progress now to be able to competently complete the intermediate exam this coming Saturday 23rd October.Mike Bryant has worked really hard to ensure that we are well prepared for the task at hand, so it’s down to Patrick and myself to do justice to Mike.just a few more hours of reading and a good nights sleep on Friday to be ready to take the plunge. Well finally Patrick and myself reached our goal and successfully passed the Intermediate exam, I personally would like to thank Mike Bryant for all the time and effort he has put into helping me get though the course.